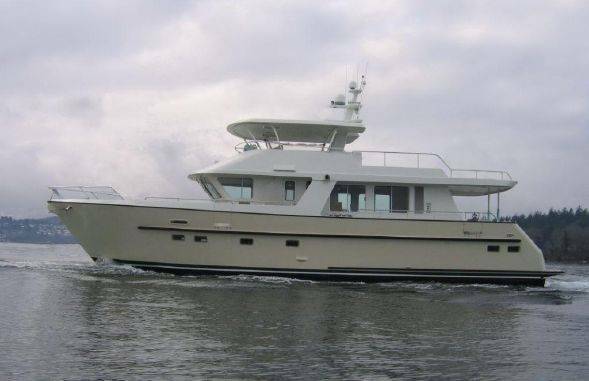 Retired Sailor III is a custom built, aluminum, bluewater cross-over trawler/motoryacht that is comfortable, a joy to operate and in excellent condition. Designed by renowned naval architect, Gregory Marshall, construction began in 2004 by the well-respected build team at Park Isle Marine in Victoria, British Colombia and she was commissioned in 2008 as a Snowbird 73. The owner and his family were deeply involved in the smallest of details in the construction process, with consultancy by Steve D’Antonio. She has since enjoyed an open budget maintenance program by Deltaville Boatyard. She was constructed with the best equipment available, such as Trac stabilizers, ABT bow thruster, Scania main engines, Village Marine Tec watermaker, Maretron monitoring system and Rex and Charles isolation transformers. Her semidisplacement hull, 5’7″ draft, 1,710 gallon fuel capacity and 3 stateroom, 3 head layout make her very a versatile cruiser for longer passages or coastal cruising. Nothing has been spared on maintenance, so Retired Sailor is turn-key for her next owner. Her original owners have completed their cruising plans, so Retired Sailor is now offered at an extremely attractive asking price. Contact Curtis Stokes via Email or call 954-684-0218 for more information and an appointment to view this Snowbird 73 trawler for sale.